Here at Park Farm, my family have been happily milking a herd of cows for three generations. A few years ago we thought we would try making cheese. The cheese is made in the same buildings in which my grandmother made her cheddar. The cows are just a few hundred yards away. 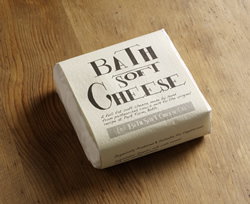 The local Bath Cheese was once well known, and in its heyday was recommended to Admiral Lord Nelson in a letter from his father (dated 1801). We found the recipe in an old grocer’s recipe book. It stipulates that the cheese must be made with full cream milk, that salt be sprinkled on the young cheese with the aid of a feather, and that the cheese was soft and covered with white mould. Today the Bath Soft Cheese that we make (without the aid of feathers) frequently wins awards and we supply shops and delicatessens all over the country. 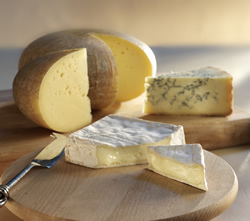 As well as our original Bath Soft Cheese we produce a variety of other cheeses: soft, hard and blue. 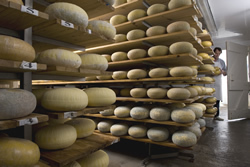 All of them are made with old fashioned manual methods which gives the cheeses more flavour. This entry was posted in Dairy and eggs, Keynsham. Bookmark the permalink. Both comments and trackbacks are currently closed.